VolvoxAureus - Amy's pottery: Tomorrow night! Tomorrow night is the Premiere of Coraline, the animated movie based on Neil Gaiman's novel. The red-carpet premiere is in Portland, and I'm going! No, I'm not anyone special, I just bought them. I wouldn't probably cross the street to see most famous people. But Neil is a good writer and a fascinating blogger. I really enjoy his books, but I read his blog religiously. It is the ONLY blog I read regularly. He writes almost every day, and I love hearing about his daily life and his creative process. Even though he writes about writing, not pottery, the idea is the same. He has ideas that he struggles with and ideas that come easily. Some ideas he puts in the attic for years, then pulls them out and writes a Newbery award winning book based on them. I don't want to go on about his blog. It's great and you should read it, but that's not really the point. The point is that he will be there tomorrow. There is a party/reception after the movie and there is the possibility that if I come up with something to say and don't chicken out at the last minute, I could meet him. So at some point it occurred to me that I could do more than just meet him, I could give him something. I could give him a piece of pottery. I know he drinks tea, and I've been toying with an idea (inspired by Laika's Coraline boxes) of creating tea sets in hand-lined wooden boxes. 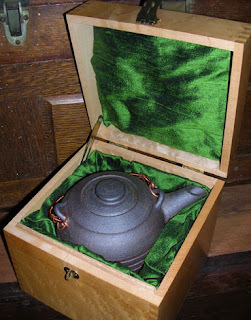 Being a librarian, I just happen to have an old card-file box, so I lined it with green silk dupioni and nestled one of my favorite teapots inside. I also put a Volvox on the lid. So the question now is: do I give it to him at the event, assuming there is actually a chance to do so? Will he like it? Will he use it? Or will it go into a pile with all the other weird things that fans have given him over the years? And does that matter? I'm not sure. So I think what I'll do is this: I'll get it all ready to go. I'll take it and see what happens. I know that if I leave it at home I'll wish I had it. At least if I have it and decide not to give it to him (or don't have the chance), I won't have any regrets.